Introducing the Enkloze KLASIK, our second generation model of secure, durable, functional, and stylish aluminum luggage. Made with 100% High Quality Thick Aluminum metal, the Enkoze KLASIK features 4 Peroma (German) wheel caster spinner mobility, interior organization, any-height adjustable aluminum pull rod, and the envy of everyone at the airport. With our 5 year warranty, travel in stlye with peace of mind. The Enkloze KLASIK embodies the essence of travel. With the Enkloze KLASIK, walk through the airport like you own the place. Made with high quality thick aluminum metal, the Enkloze KLASIK is ready for miles and miles of travel and a lot of class. No matter if you are in economy or business class, always travel with class with the Enkloze KLASIK. Comes with our 5-year warranty, but its gonna last a lot longer than that! The Enkloze KLASIK features Peroma 360 degree spinner wheels (Germany) with 8 wheel durabiltity, the KLASIK glides like butter on toast. Everything the Enkloze KLASIK is made of is used for a functional and secure purpose, no wasted parts, ensuring miles and miles of travel. Don't like paying over-weight charges? So do we. 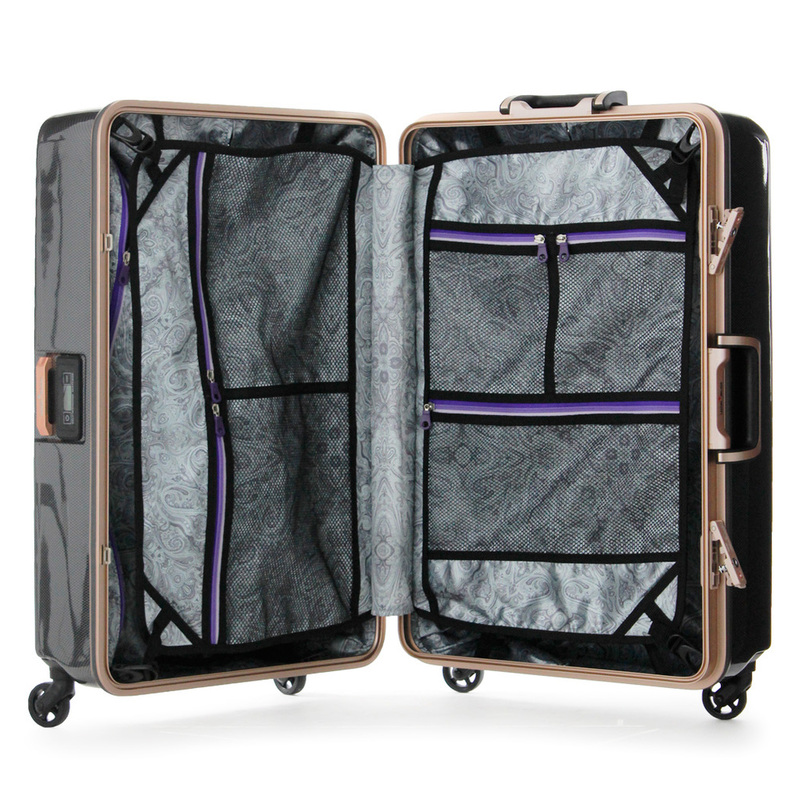 Introducing the ENKLOZE Weight Watcher Suitcase, featuring self-weighing functionality. Never go to the airport not knowing if you have packed too much; with the ENKLOZE Weight Watcher you will know exactly how much your luggage weighs before and after you leave the airport. Equipped with a built-in digital LCD scale that indicates the gross weight of the suitcase when it is stood up. Sensors on the side of the luggage enable you to know how much it ways in kilograms. The digital scale is powered by a watch a battery (removable if necessary) for years of use. Along with key locked TSA locks for security, you will never have to sweat it out at the airport again. Suitcase comes in 25" and 29" sizes. Introducing the ENKLOZE X1 Carbon Carry On . The X1 features a 100% Polycarbonate hard shell, (1) TSA combination lock and (1) TSA key lock (keys provided), ultra quiet Hinomoto caster wheels, reinforced corners, height adjustable pull rod, front loading laptop pouch, and much more. Travel in style with the ENKLOZE X1 Carbon Carry On. Available in Carbon Black, White, and limited Blue. 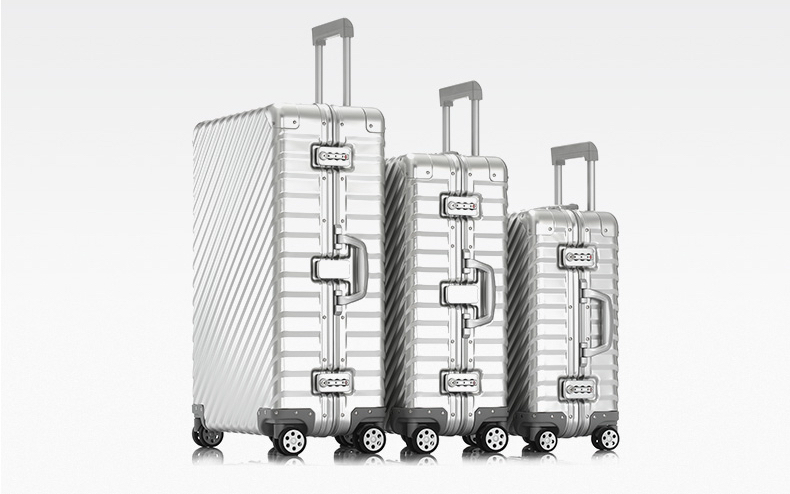 Our second model of Aluminum luggage comes in a simple and classic design. Manufactured with strong aluminum Materials, featuring auto folding handles, TSA COMBO LOcks, any-Height Aluminum pull handle, reinforced corners, and interior organization. the Enkloze klasik provides the perfect combination of power and SIMPLICITY. COmes with free shipping and 5-year warranty. Whether you travel for work or for pleasure, today's modern traveler takes traveling seriously and so do we. Introducing the BLADE X, the worlds first one piece molded mono-block 100% aluminum alloy hard shell luggage that provides all the baggage necessities you need when traveling along with ease, durability, and style. The BLADE X also features ultra quiet Hinomoto (Japan) dual wheels, TSA approved locks, interior space dividers, and much more. All of our luggage comes with TSA approved locks and hardsided enclosures . Check this link on why TSA locks are better than zippers. 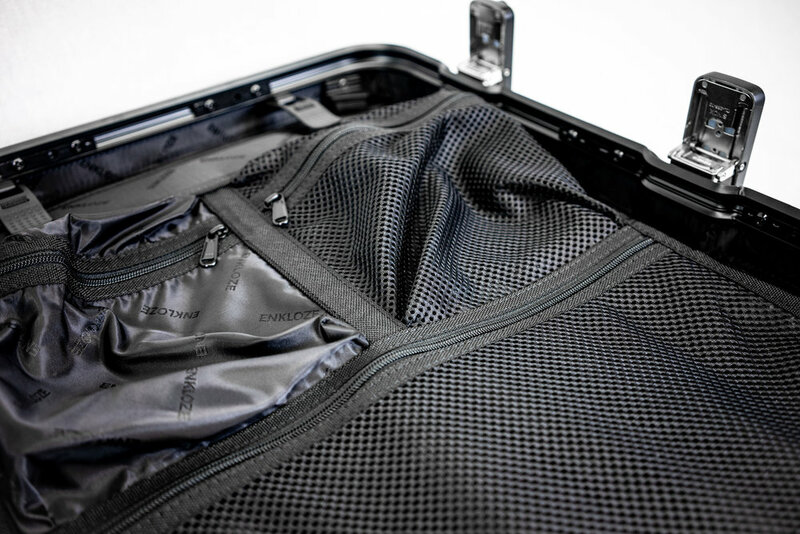 All of our luggage have interior space dividers, x-bands, and zippered pockets to ensure your contents are secure and organized, while being protected with hardsided enclosures. 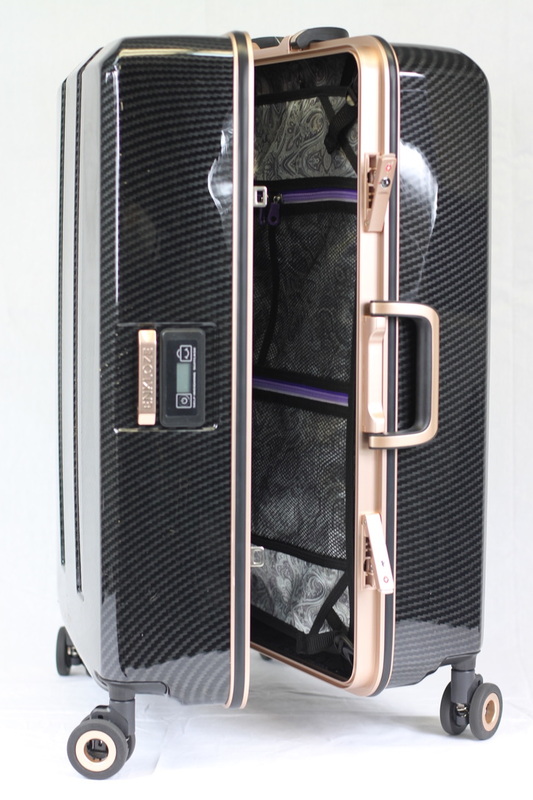 All of our luggage are spinners, manufactured with ultra quite caster wheels designed in Japan, allowing for stress free mobility at the airport. Sign up and be the first to know about discounts, new products, and more! Copyright ©2018 ENKLOZE INC. ENKLOZE and its logo are trademarked. All Rights Reserved.